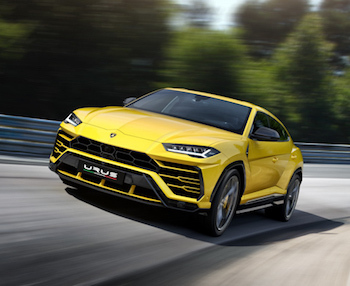 Lamborghini has launched a third model to its range, the Lamborghini Urus, which returns the brand to the high-performance SUV segment for only the second time ever, three decades after it previously made its mark with the LM002. 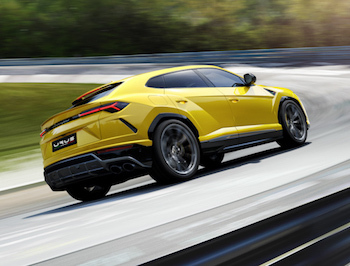 The Urus features a 4.0 liter V8 twin-turbo engine delivering 650 hp (478 kW) at 6,000 rpm, maximum 6,800 rpm, and 850 Nm of maximum torque already at 2,250 rpm. With 162.7 hp/l the Urus claims one of the highest specific power outputs in its class and the best weight-to-power ratio at 3,38 kg/hp. The Urus accelerates from 0-100 km/h in 3.6 seconds, 0-200 km/h in 12,8 seconds and with a top speed of 305 km/h it is the fastest SUV available. It goes on sale in Europe priced at 171,429 euros excluding taxes.